UniverCity’s winning reputation attracts national and international media attention, including coverage in BC Business Magazine, Granville Magazine, Vancouver Magazine, Shared Vision, Sunday New York Times, Maclean’s Magazine, Grist Magazine, Dialogue Magazine, Business in Vancouver Green Edition, the Toronto Star, and the Vancouver Province and Sun. David Suzuki’s television program the Nature of Things highlighted UniverCity as a healthy, walkable community on ‘The Weight of the World’, as did Metro Vancouver on their program ‘Our Livable Region’. UniverCity is also often featured as a leader in sustainable development at workshops and conferences across Canada, the USA, and beyond. 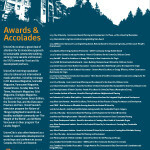 Download the list of Awards + Accolades UniverCity has received here.